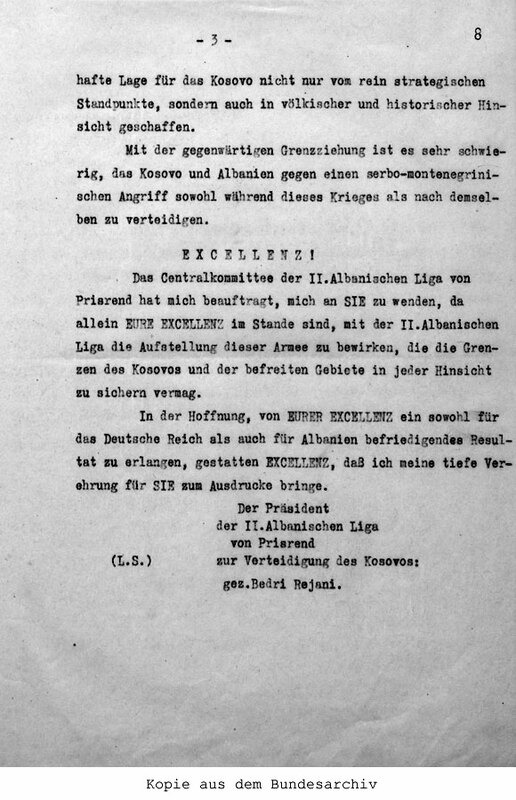 Mobilisation of Kosovo and the liberated Albanian regions under German leadership. 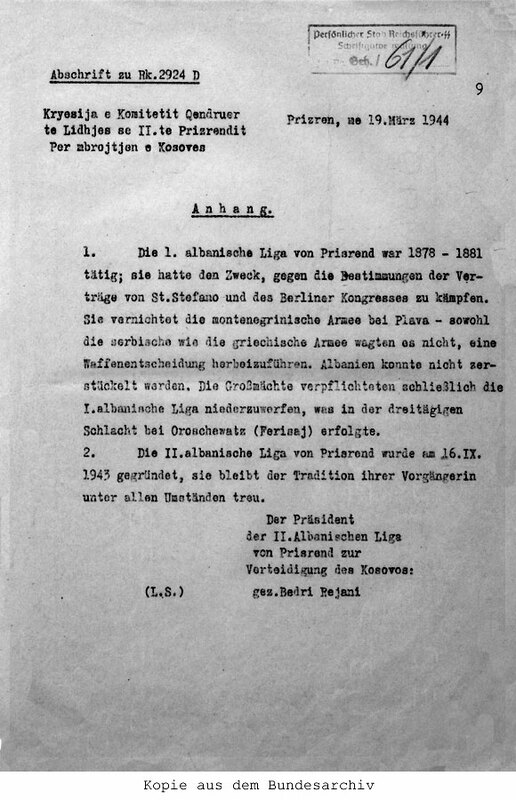 In view of the nerve-racking phase in which the Albanian problem finds itself due to the current military situation, the Central Committee of the Second Albanian League of Prizren, in agreement with the government and the population, has decided to call for the general mobilisation of Kosovo and all Albanian regions that were annexed to Albania as a result of the armed intervention of the German Army in 1941, in order to ensure the definitive liberation of the Albanian people, side by side with the German Reich, in the current fighting. 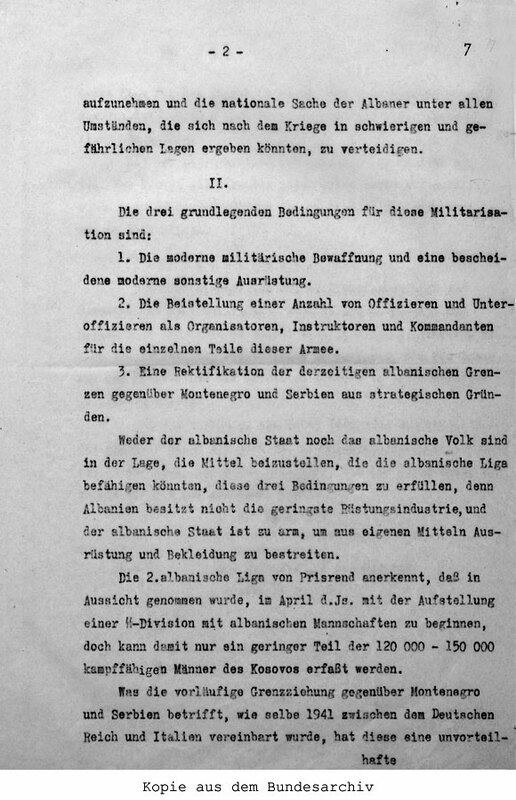 The aim of this mobilisation is to set up an army of 120,000-150,000 volunteers capable of opposing and successfully defeating the Serbo-Montenegrin partisans for as long as the current war lasts and, under all circumstances, of defending Albanian national interests after the war in any difficult or perilous situations that might arise. 1. Modern military weaponry and a modest amount of other modern equipment. 2. The provision of a number of commissioned and non-commissioned officers to organise, instruct and command the various components of this army. 3. A rectification of the current Albanian borders with Montenegro and Serbia for strategic reasons. Neither the Albanian State nor the Albanian people are in a position to provide the support needed to enable the Albanian League to fulfil these three conditions because Albania has no arms industry at all and the Albanian State is too poor to finance the equipment and uniforms of its own accord. 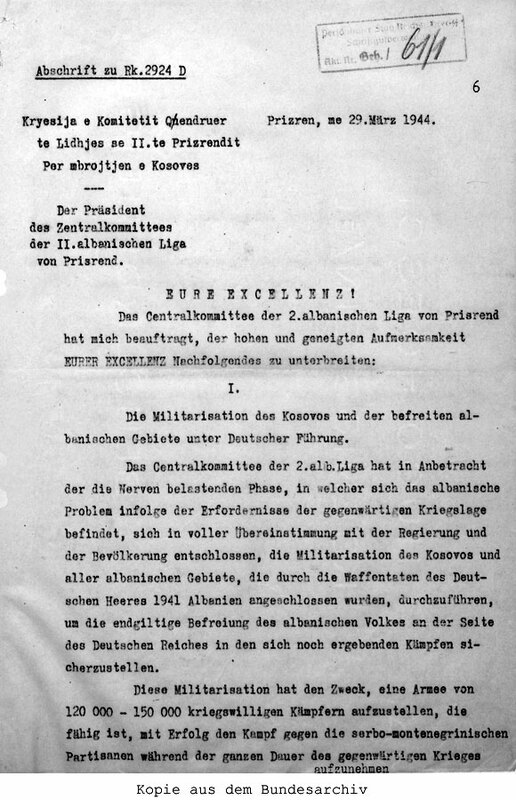 The Second Albanian League of Prizren is aware that plans were made to begin setting up an SS Division with Albanian fighters in April of this year, but these would only make up a small proportion of the 120,000-150,000 able men needed in Kosovo. With regard to the provisional border with Montenegro and Serbia, as agreed in 1941 between the German Reich and Italy, it is disadvantageous for Kosovo not only from a purely strategic perspective but also for demographic and historical reasons. With the border as it is, it would be very difficult for Kosovo and Albania to defend themselves from a Serbo-Montenegrin attack either during this war or thereafter. 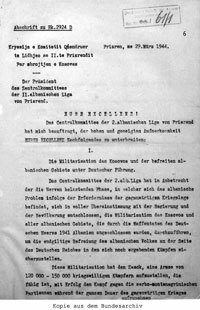 The Central Committee of the Second Albanian League of Prizren has asked me to appeal to you since only Your Excellency is in a position to raise an army, with the Second League of Prizren, that could provide comprehensive defence for the borders of Kosovo and the liberated regions. 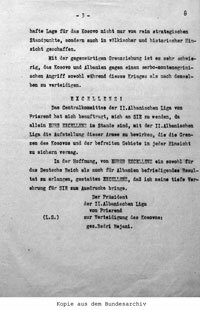 In the hope of attaining a satisfactory solution from Your Excellency both for the German Reich and for Albania, I would ask Your Excellency to accept the expression of my profound respect. 1. The First Albanian League of Prizren was active in 1878-1881; its objective was to oppose the provisions of the treaties of San Stefano and Congress of Berlin. It defeated the Montenegrin army near Plava such that neither the Serbian nor the Greek army dared to intervene militarily and they were unable to divide Albanian up. The Great Powers then decided to put down the First Albanian League, which they did at the three-day battle of Oroshevats (Ferizaj). 2. 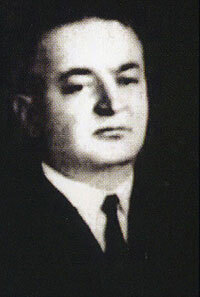 The Second Albanian League of Prizren was founded on 16 September 1943 and remains faithful under all circumstances to the traditions of its predecessor. 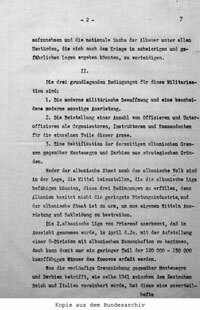 Acknowledgment of receipt: Personal Staff of the Reichsführer SS. Document administration, File No. Geh./61/1.